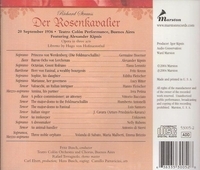 “The Teatro Colón’s performance of Strauss’ DER ROSENAKVALIER was recorded on 20 September 1936, just two days prior to recording Wagner’s PARSIFAL. This is, undoubtedly, the earliest known live recording of DER ROSENKAVALIER and it is fascinating from several standpoints. Although the voices of Tiana Lemnitz and Alexander Kipnis are familiar to most operatic collectors, this is the only recording where they can be heard in their complete roles as Octavian and Ochs. This recording also gives us the opportunity to hear other well known singers, namely Germaine Hoerner, who otherwise made no commercial recordings. Perhaps the most intriguing aspect of this performance, however, is Fritz Busch’s compelling and delightfully idiosyncratic handling of the score, so temperamentally opposite to his conducting of Mozart in those vaunted Glyndebourne recordings from the same period. The only really unsatisfying feature of this performance is that it is so heavily cut in all three acts, about 30 minutes in all. The cuts range in size from a few bars to several pages, and one can only speculate as to why they might have been made. It should be mentioned, though, that the practice of making cuts in Der Rosenkavalier was customary at this time, even in German houses. The recordings were all made on sixteen-inch, aluminum-based, lacquer-coated discs, using two turntables running at approximately 33 rpm. I have been told that the recording equipment was located in the basement of the Colón and that three microphones were used, one above the orchestra, a second above the front of the stage, and a third over the rear of the stage. In remastering this recording, my first task was to eliminate as much surface noise as possible without compromising the sound on the original discs. This was accomplished by carefully cleaning the discs and by keeping them wet during play-back. I also found that using several different sizes of styli on different portions of the discs produced an enormous sonic improvement. I next attempted to remove many hundreds of clicks and pops which afflict this recording. CEDAR technology proved to be a tremendous help in this process, but many pops still had to be manually removed. Finally, while transferring each side I noticed some pitch instability due to slight speed fluctuation on the original discs. Throughout the remastering process, I made careful adjustments in speed in order to keep the pitch as constant as possible. “Germaine Hoerner studied at a Strasbourg conservatory and completed her studies at the Paris Conservatoire. She made her début at the Paris Opéra on 22 November 1929 as Rossweiss in LA VALKYRIE and sang Sieglinde the following year. She was the leading dramatic soprano in Paris until her retirement from the stage in 1955, her only real rival being the great Germaine Lubin. She was particularly associated with Wagner (Senta, Elisabeth, Gutrune, Elsa). Her repertoire was very broad, spanning classical 18th century opera, lyric roles, and near-coloratura parts. She was associated with some noted Paris revivals, such as LA JUIVE, in which she sang Rachel to Paul Franz’s Eléazar in 1933 and Valentine to George Thill’s Raoul in LES HUGUENOTS in 1936. She appeared with Arthur Endrèze in the stage premiere of Albéric Magnard’s GUERCOEUR in 1931 and appeared as Photine in the world premiere of Max d’Ollone’s LA SAMARITAINE with André Pernet and José de Trevi. In addition to the Marschallin, her Strauss repertory included Chrysothemis, which she sang at the Paris premiere of ELEKTRA in 1932, with Lubin in the title role. Her other 1936 Colón performances included LOHENGRIN, under Fritz Busch, and CASTOR ET POLLUX and ALCESTE under Hector Panizza. Also at the Colón, she appeared as the Empress in the American premiere of DIE FRAU OHNE SCHATTEN in 1949 under Erich Kleiber. In her retirement she taught singing in Strasbourg. Germaine Hoerner was reputed to have a large but flexible voice, brilliant in its upper register. No commercial recordings of Hoerner’s have ever surfaced, so we are indeed lucky to have two off the air performances from South America: Elisabeth and the Marschallin heard here. Alexander Kipnis entered the Warsaw Conservatory at age 19. In 1912 he traveled to Berlin, where he began studying voice with Ernst Grenzebach, who was also the teacher of Lauritz Melchior, Max Lorenz, and Meta Seinemeyer. While in Berlin, Kipnis, a Russian, was interned. Freed in 1915, he made his stage début in Hamburg, singing three Strauss songs as a ‘guest’ in the second act party scene of DIE FLEDERMAUS. In 1922 Kipnis joined the Deutsches Opernhaus in Berlin; from 1923–1932 he was on the roster of the Chicago Civic Opera; in 1927 he sang in PARSIFAL under Karl Muck at the Bayreuth Festival; and in 1938 he settled permanently in the United States. By the time of his Metropolitan Opera début in 1940 as Gurnemanz, he had sung at virtually every major opera house and festival, including the Colón, where he appeared in 1926, 1928, 1931, 1934–1936, and 1941. Following his retirement from the Metropolitan in 1946 (his last concert appearances were in 1951), he began teaching, first at the New York College of Music and then in 1966 at the Juilliard School. Alexander Kipnis’ voice was large and beautiful, admired particularly in the Russian repertory, and his acting talent, versatility, and skill as a lieder singer are also well-known. Tiana Lemnitz studied at Hoch’s Conservatory in Frankfurt am Main with Anton Kohmann. She made her operatic début in Lortzing’s UNDINE in Heilbronn in 1920. From 1922 to 1928 she sang in Aachen (according to Hugo Wolf Society’s album, her operatic début was there in 1922). Lemnitz subsequently pursued a distinguished career as a member of the Hannover Opera from 1928 to 1933. She was a regular guest at the Dresden State Opera (1933–1934) and an esteemed member of the Berlin State Opera from (1934–1935), where she appeared in the world premiere of Henze’s DER PRINZ VON HOMBURG in 1935. She also made guest appearances in Vienna, Munich, Rome, London’s Covent Garden (1936, 1938) and Buenos Aires’ Teatro Colón as Octavian in this performance in 1936. The same season she performed in DIE FLEDERMAUS, LE NOZZE DI FIGARO (Countess), and LOHENGRIN (Elsa). Lemnitz returned to the Colón in 1950 as Sieglinde in DIE WALKÜRE, Jenufa in JENUFA, and Pamina in DIE ZAUBERFLÖTE, all under the baton of Karl Böhm. Her repertoire included many leading roles in German, Italian, French, and Russian operas. She sang Pamina; Aïda; Micaëla; Wagner’s Elsa, Eva, and Sieglinde; and Strauss’s Octavian as well as the Marschallin. One of her most admired performances was at the 1939 Salzburg Festival, where she sang Agathe in Weber’s DER FREISCHÜTZ. Tiana Lemnitz was known for her exquisite singing, delicate tone, and subtlety of expression. Fritz Krenn studied at the Wiener Musikakademie and made his stage début in 1917. From the mid-1920s he sang at several of the Berlin opera houses and took part in the world premiere of Hindemith’s NEUES VOM TAGE at the Kroll-Oper under Klemperer (1929). At the Teatro Colón he made his début during the 1931 season as Jokanaan in SALOME, and also took part in DIE FLEDERMAUS, TRISTAN UND ISOLDE, DAS RHEINGOLD, and GÖTTERDÄMMERUNG. Krenn appeared at the Salzburg Festival (1935, 1938, 1939) as Pizarro in FIDELIO and Baron Ochs in DER ROSENKAVALIER, his most famous role, which he sang nearly 400 times. Krenn returned to the Colón for the 1936 season, singing in LOHENGRIN, PARSIFAL, DIE FLEDERMAUS, and DER ROSENKAVALIER. In 1939 at the San Francisco Opera, he sang in FIDELIO with Kirsten Flagstad, Alexander Kipnis, and Marjorie Lawrence, and in DIE WALKÜRE with Flagstad, Lawrence, Kipnis, and Lauritz Melchior. At the Vienna Opera after the war he sang 39 performances as Ochs in DER ROSENKAVALIER. There he also sang CAVALLERIA RUSTICANA, FIDELIO (Pizarro, Don Fernando), DER ZIGEUNERBARON (Homonay, Zsupan), THE BARTERED BRIDE (Kezal), DIE MEISTERSINGER (Kothner), DON GIOVANNI (Leporello), DER FREISCHÜTZ (Ottokar), ARABELLA (Waldner), and many other roles. During these years he became a member of the Volksoper, singing several hundred operetta performances. He also sang at the Bayreuth Festival, La Scala, and Covent Garden. Krenn made a late début (he was 63 years old) at the Metropolitan in New York during the 1950 season, singing seven performances as Baron Ochs, and lived out his last years in Vienna with his wife Luise Kornfeld. Editha Fleischer studied with Lilli Lehmann and made her début in 1918 in Berlin. She sang Susanna in LE NOZZE DI FIGARO and Zerlina in DON GIOVANNI at the Salzburg Festival in 1922. She toured North America between 1922–1924 with the German Opera Company and then remained in the United States to join the William Wade Hinshaw Opera Company. In 1926 she joined the Metropolitan Opera in the role of First Lady in DIE ZAUBERFLÖTE and sang 400 performances with the Metropolitan Opera from 1926–1936. She took part in the first complete Metropolitan broadcast of HANSEL UND GRETEL as Hansel, with Queena Mario as Gretel. At the Teatro Colón she sang in five seasons, 1933/1937: 1933, DIE MEISTERSINGER (Eva), DER ROSENKAVALIER (Sophie), and FIDELIO (Marcellina); 1934, FALSTAFF (Alice), LA FIAMMA (Monica), COSÍ FAN TUTTE (Despina), ARABELLA (Zdenka), and THE BARTERED BRIDE (Marenka); 1935, FALSTAFF (Alice), SCHWANDA (Dorota), and DON GIOVANNI (Zerlina); 1936, WERTHER (Sophie), LE NOZZE DI FIGARO (Susanna), and DIE FLEDERMAUS (Adele); 1937, FALSTAFF (Alice), and FIDELIO (Marcellina). Fleischer was married to conductor Erich Engel, who was Busch and Kleiber’s assistant at the Colón for nearly 15 years and she was the sister of Hanns Fleischer who also sang in 1936 ROSENKAVALIER performance. During the 1940s she taught singing at the Colón and later taught at the Conservatory of the city of Vienna. Editha Fleischer was a highly regarded concert soprano. Hanns Fleischer specialized in buffo or character roles, such as Pedrillo, Monostatos, and Mime, which he first sang in the German provinces. He was hired by the Leipzig Opera beginning with the 1924–1925 season, and took part in the premiere of D’Albert’s DIE SCHWARZE ORCHIDEE there in 1928 and that of Kurt Weill’s AUFSTIEG UND FALL DER STADT MAHAGONNY in 1930. Between 1933 and 1936 he appeared at Covent Garden, where his interpretation of Mime was particularly well received and performed in Antwerp and Amsterdam. He sang at the Colón during 1934–1936 as Wenzel (THE BARTERED BRIDE), Elemer (ARABELLA), Heinrich (TANNHÄUSER), Mime (DAS RHEINGOLD), Mime (SIEGFRIED), Basilio (LE NOZZE DI FIGARO), and Alfred (DER FLEDERMAUS). Irra Petina’s father, General Stepan Petina, was personal adjutant to the last Russian Czar. After the 1917 Revolution she and her family fled to China. There she first appeared on the stage in a small part in EUGEN ONÉGIN. In 1930 she came to the United States and began her vocal training at the Curtis Institute of Music in Philadelphia. After some appearances in concert, she made her début at the Metropolitan Opera (1934); her first role was that of Desire Annable in the world premiere of Hanson’s MERRY MOUNT. She remained at the Met until 1950 in 345 performances at the house and 99 performances on tour! She was highly regarded as Martha in KHOVANSHCHINA in 1950. Her other roles at the 1936 Colón season were Maddalena (RIGOLETTO), Nicklausse (LES CONTES D’HOFFMAN), Marcellina (LE NOZZE DI FIGARO), Orlofsky (DIE FLEDERMAUS) and Mary (DER FLIEGENDE HÖLLANDER). She also appeared in the world premiere of Leonard Bernstein’s CANDIDE on Broadway. She made guest appearances in Los Angeles and San Francisco and after 1950 was outstandingly successful in operetta, notably SONG OF NORWAY, based on the life of Grieg. She was also esteemed as an interpreter of Russian songs. Arturs Priednieks-Kavara studied with Buttner in Berlin and continued his studies in Vienna. He changed his name to ‘Cavara’ in honor of his favorite role, Cavaradossi. In the printed program of the 1936 Colón DER ROSENKAVALIER he appears as J. Cavara though he usually sang under the name of Artur Cavara. At the Kroll Oper he sang the principal tenor roles in CONTES D’HOFFMANN, L’HEURE ESPAGNOLE, Ibert’s ANGÉLIQUE, THE BARTERED BRIDE, Krenek’s LEBEN DES OREST, Auber’s LA MUETTE DE PORTICI, IL BARBIERE DI SIVIGLIA. RIGOLETTO, Janácek’s FROM THE HOUSE OF THE DEAD, and the world premiere of Hindemith’s NEUES VOM TAGE with Stückgold, Krenn, Wirl, Kalter, and Ernster under Otto Klemperer. He also sang at the Charlottenburg Opera in SALOME (Narraboth) with Maria Nemeth and Hans Reinmar; UNDINE (Hugo von Ringstetten) with Gerhard Hüsch; and in OBERST CHABERT an opera by Hermann Waltershausen (Graf Ferraud) with Hans Reinmar and Gerhard Hüsch. He also sang in the world premiere of Zemlinsky’s DER KREIDEKREIS in Zurich, 1933. After WWII he traveled to the United States, where he later became a vocal teacher. German musical life was influenced by many outstanding conductors during the first half of the 20th century. Fritz Busch was one of the greatest among them. Two of his brothers also achieved world renown as musicians: Adolf, violinist and composer, and cellist Hermann. Already a proficient pianist as a young child, Fritz Busch attended the Cologne Conservatory from 1906 to 1909, studying piano with Karl Boettcher and conducting with Fritz Steinbach. Immediately after graduating he conducted at the Deutsches Theater in Riga. The following year he was conductor of the spa orchestra in Bad Pyrmont, and in the winter months director of the Musikverein in Gotha. In 1911 he married Grete Boettcher, the niece of his piano teacher, and in 1912 he was appointed Music Director of the city of Aachen. His work in Aachen was interrupted by the First World War, in which he served as a soldier. From 1918 to 1922 he conducted in Stuttgart, before being called to the Sächsische Staatsoper in Dresden. Until 1933 Fritz Busch led the Sächsische Staatskapelle in over 1000 opera and concert performances. In addition to championing the then practically unknown works of Giuseppe Verdi, he was also an open-minded supporter of the musical avant-garde of the 1920s. Richard Strauss was so delighted with the world premieres of his operas INTERMEZZO and DIE AEGYPTISCHE HELENA, that he dedicated his ARABELLA to Fritz Busch and Dresden’s Intendant Dr. Alfred Reucker. In 1924 the Bayreuth Festival reopened after a ten-year hiatus, with Fritz Busch conducting DIE MEISTERSINGER. He was also a frequent guest conductor in New York, Berlin, Leipzig, Salzburg, and other European music centers. Because Fritz Busch refused to collaborate with the National Socialists, he was driven out of the Staatsoper in Dresden in a dramatic episode before a RIGOLETTO performance on 7 March 1933. He left Germany and found new spheres of activity in Buenos Aires, Copenhagen, Stockholm, and New York. With his friend, the stage director Carl Ebert, he founded the Glyndebourne Festival, which rapidly achieved world fame. In the fall of 1950 Fritz Busch conducted at the Vienna State Opera, and was asked to become its musical director. Only in 1951 did he return to Germany. He was so enthusiastically received in Cologne and Hamburg that he believed it was possible to build new bridges to a new Germany. But unfortunately this was never to happen. After a successful season in Glyndebourne and a guest appearance in Edinburgh, Fritz Busch died in London on 14 September 1951.